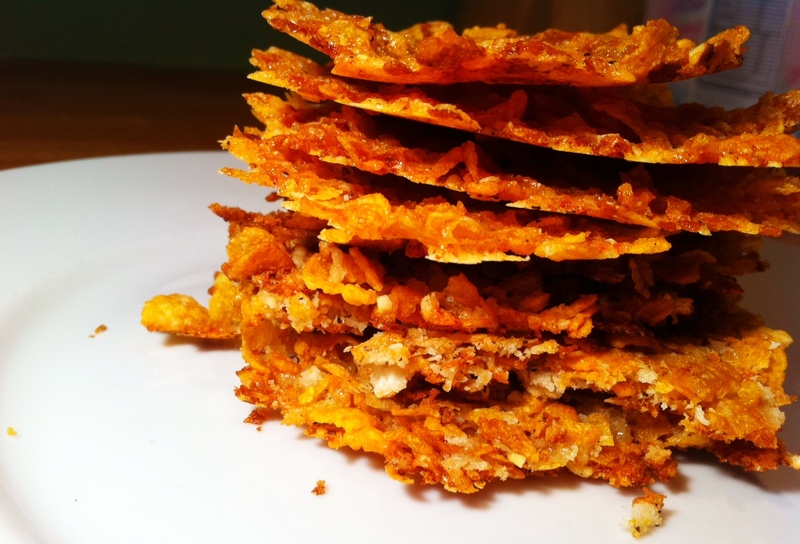 Crush the cornflakes slightly with your hand but don’t grind them down to dust! Mix all the ingredients together and in a hot, non-stick fry pan over a medium fire, spoon a tablespoon of the cornflake mix and loosely spread it on the hot plate into a rough circle. Leave the cheese to melt and turn golden brown on the edges. Trick is not to have the heat too high or else you’ll start burning the cheese. You can flip them over if you want but it looks better without because your crisp will remain textured on the top but flat and shiny on the bottom. Place them on paper napkins to drain any excess oil from the cheese – this will help them to crisp up too. All that’s left is to tuck in. Yum yum!